Proprietary Name: Loxapine What is the Proprietary Name? Non-Proprietary Name: Loxapine What is the Non-Proprietary Name? Loxapine with NDC 70518-1896 is a a human prescription drug product labeled by Remedyrepack Inc.. The generic name of Loxapine is loxapine. The product's dosage form is capsule and is administered via oral form. FDA Application Number: ANDA090695 What is the FDA Application Number? b,f][1,4]oxazepine. It is present as the succinate salt. Each capsule for oral administration, contains loxapine succinate, USP 6.8, 13.6, 34.0 or 68.1 mg equivalent to 5, 10, 25 or 50 mg of loxapine base respectively. It also contains the following inactive ingredients: anhydrous lactose, colloidal silicon dioxide, gelatin, magnesium stearate, polacrilin potassium, sodium lauryl sulfate, talc, titanium dioxide, D&C Yellow #10 and FD&C Blue #1. Additionally, the 5 mg capsule contains D&C Red #33, the 10 mg capsule contains D&C Red #33 and D&C Red #28, and the 25 mg capsule contains FD&C Yellow #6.In addition, the black imprinting ink contains shellac glace in ethanol, iron oxide black, n-butyl alcohol, propylene glycol, FD&C Blue #2/indigo carmine aluminum lake, FD&C Red #40/Allurea Red AC aluminum lake, FD&C Blue #1/brilliant Blue FCF aluminum lake, D&C Yellow #10 aluminum lake, SDA 3A alcohol, and methanol. The white imprinting ink contains pharmaceutical glaze in SD-45, titanium dioxide, isopropyl alcohol, ammonium hydroxide, propylene glycol, n-butyl alcohol and simethicone. Pharmacologically, loxapine is an antipsychotic for which the exact mode of action has not been established. However, changes in the level of excitability of subcortical inhibitory areas have been observed in several animal species in association with such manifestations of tranquilization as calming effects and suppression of aggressive behavior.In normal human volunteers, signs of sedation were seen within 20 to 30 minutes after administration, were most pronounced within one and one-half to three hours, and lasted through 12 hours. Similar timing of primary pharmacologic effects was seen in animals. Loxapine Capsules, USP are indicated for the treatment of schizophrenia. The efficacy of loxapine in schizophrenia was established in clinical studies which enrolled newly hospitalized and chronically hospitalized acutely ill schizophrenic patients as subjects. 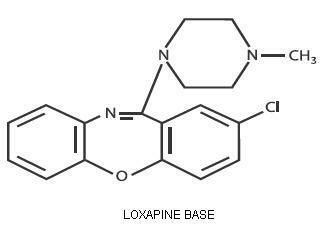 Loxapine is contraindicated in comatose or severe drug-induced depressed states (alcohol, barbiturates, narcotics, etc. ).Loxapine is contraindicated in individuals with known hypersensitivity to dibenzoxazepines. not available or appropriate. In patients who do require chronic treatment, the smallest dose and the shortest duration of treatment producing a satisfactory clinical response should be sought. The need for continued treatment should be reassessed periodically. A potentially fatal symptom complex sometimes referred to as Neuroleptic Malignant Syndrome (NMS) has been reported in association with antipsychotic drugs. Clinical manifestations of NMS are hyperpyrexia, muscle rigidity, altered mental status, and evidence of autonomic instability (irregular pulse or blood pressure, tachycardia, diaphoresis, and cardiac dysrhythmias).The diagnostic evaluation of patients with this syndrome is complicated. In arriving at a diagnosis, it is important to identify cases where the clinical presentation includes both serious medical illness (e.g., pneumonia, systemic infection, etc.) and untreated or inadequately treated extrapyramidal signs and symptoms (EPS). Other important considerations in the differential diagnosis include central anticholinergic toxicity, heat stroke, drug fever, and primary central nervous system (CNS) pathology.The management of NMS should include: 1) immediate discontinuation of antipsychotic drugs and other drugs not essential to concurrent therapy, 2) intensive symptomatic treatment and medical monitoring, and 3) treatment of any concomitant serious medical problems for which specific treatments are available. There is no general agreement about specific pharmacological treatment regimens for uncomplicated NMS.If a patient requires antipsychotic drug treatment after recovery from NMS, the potential reintroduction of drug therapy should be carefully considered. The patient should be carefully monitored, since recurrences of NMS have been reported.Loxapine, like other antipsychotics, may impair mental and/or physical abilities, especially during the first few days of therapy. Therefore, ambulatory patients should be warned about activities requiring alertness (e.g., operating vehicles or machinery) and about concomitant use of alcohol and other CNS depressants.Loxapine has not been evaluated for the management of behavioral complications in patients with mental retardation, and therefore, it cannot be recommended. Loxapine may cause somnolence, postural hypotension, motor and sensory instability, which may lead to falls and, consequently, fractures or other injuries. For patients with diseases, conditions, or medications that could exacerbate these effects, complete fall risk assessments when initiating antipsychotic treatment and recurrently for patients on long-term antipsychotic therapy. 3) should discontinue Loxapine Succinate Capsules, USP and have their WBC followed until recovery. in vitro, a factor of potential importance if the prescription of these drugs is contemplated in a patient with a previously detected breast cancer. Although disturbances such as galactorrhea, amenorrhea, gynecomastia, and impotence have been reported, the clinical significance of elevated serum prolactin levels is unknown for most patients. An increase in mammary neoplasms has been found in rodents after chronic administration of antipsychotic drugs. Neither clinical studies nor epidemiologic studies conducted to date, however, have shown an association between chronic administration of these drugs and mammary tumorigenesis; the available evidence is considered too limited to be conclusive at this time. There have been rare reports of significant respiratory depression, stupor and/or hypotension with the concomitant use of loxapine and lorazepam.The risk of using loxapine in combination with CNS-active drugs has not been systematically evaluated. Therefore, caution is advised if the concomitant administration of loxapine and CNS-active drugs is required. Neonates exposed to antipsychotic drugs, during the third trimester of pregnancy are at risk for extrapyramidal and/or withdrawal symptoms following delivery. There have been reports of agitation, hypertonia, hypotonia, tremor, somnolence, respiratory distress and feeding disorder in these neonates. These complications have varied in severity; while in some cases symptoms have been self-limited, in other cases neonates have required intensive care unit support and prolonged hospitalization.Loxapine Succinate should be used during pregnancy only if the potential benefit justifies the potential risk to the fetus.Safe use of loxapine during pregnancy or lactation has not been established; therefore, its use in pregnancy, in nursing mothers, or in women of childbearing potential requires that the benefits of treatment be weighed against the possible risks to mother and child. No embryotoxicity or teratogenicity was observed in studies in rats, rabbits, or dogs although, with the exception of one rabbit study, the highest dosage was only two times the maximum recommended human dose and in some studies it was below this dose. Perinatal studies have shown renal papillary abnormalities in offspring of rats treated from mid-pregnancy with doses of 0.6 and 1.8 mg/kg, doses which approximate the usual human dose but which are considerably below the maximum recommended human dose. The extent of the excretion of loxapine or its metabolites in human milk is not known. However, loxapine and its metabolites have been shown to be transported into the milk of lactating dogs. Loxapine administration to nursing women should be avoided if clinically possible. Safety and effectiveness of loxapine in pediatric patients have not been established. Persistent Tardive Dyskinesia - As with all antipsychotic agents, tardive dyskinesia may appear in some patients on long-term therapy or may appear after drug therapy has been discontinued. The risk appears to be greater in elderly patients on high-dose therapy, especially females. The symptoms are persistent and in some patients appear to be irreversible. The syndrome is characterized by rhythmical involuntary movement of the tongue, face, mouth or jaw (e.g., protrusion of tongue, puffing of cheeks, puckering of mouth, chewing movements). Sometimes these may be accompanied by involuntary movements of extremities.There is no known effective treatment for tardive dyskinesia; antiparkinson agents usually do not alleviate the symptoms of this syndrome. It is suggested that all antipsychotic agents be discontinued if these symptoms appear. Should it be necessary to reinstitute treatment, or increase the dosage of the agent, or switch to a different antipsychotic agent, the syndrome may be masked. It has been suggested that fine vermicular movements of the tongue may be an early sign of the syndrome, and if the medication is stopped at that time the syndrome may not develop.Cardiovascular Effects: Tachycardia, hypotension, hypertension, orthostatic hypotension, lightheadedness, and syncope have been reported. A few cases of ECG changes similar to those seen with phenothiazines have been reported. It is not known whether these were related to loxapine administration.Hematologic: Rarely, agranulocytosis, thrombocytopenia, leukopenia. Skin: Dermatitis, edema (puffiness of face), pruritus, rash, alopecia, and seborrhea have been reported with loxapine. Anticholinergic Effects: Dry mouth, nasal congestion, constipation, blurred vision, urinary retention, and paralytic ileus have occurred. Gastrointestinal: Nausea and vomiting have been reported in some patients. Hepatocellular injury (i.e., SGOT/SGPT elevation) has been reported in association with loxapine administration and rarely, jaundice and/or hepatitis questionably related to loxapine treatment. Other Adverse Reactions: Weight gain, weight loss, dyspnea, ptosis, hyperpyrexia, flushed facies, headache, paresthesia, and polydipsia have been reported in some patients. Rarely, galactorrhea, amenorrhea, gynecomastia, and menstrual irregularity of uncertain etiology have been reported. Signs and symptoms of overdosage will depend on the amount ingested and individual patient tolerance. As would be expected from the pharmacologic actions of the drug, the clinical findings may range from mild depression of the CNS and cardiovascular systems to profound hypotension, respiratory depression, and unconsciousness. The possibility of occurrence of extrapyramidal symptoms and/or convulsive seizures should be kept in mind. Renal failure following loxapine overdosage has also been reported.The treatment of overdosage is essentially symptomatic and supportive. Early gastric lavage and extended dialysis might be expected to be beneficial. Centrally-acting emetics may have little effect because of the antiemetic action of loxapine. In addition, emesis should be avoided because of the possibility of aspiration of vomitus. Avoid analeptics, such as pentylenetetrazol, which may cause convulsions. Severe hypotension might be expected to respond to the administration of norepinephrine or phenylephrine. Loxapine Capsules, USP are administered, usually in divided doses, two to four times a day. Daily dosage (in terms of base equivalents) should be adjusted to the individual patient's needs as assessed by the severity of symptoms and previous history of response to antipsychotic drugs. Initial dosage of 10 mg twice daily is recommended, although in severely disturbed patients initial dosage up to a total of 50 mg daily may be desirable. Dosage should then be increased fairly rapidly over the first seven to ten days until there is effective control of symptoms of schizophrenia. The usual therapeutic and maintenance range is 60 mg to 100 mg daily. However, as with other drugs used to treat schizophrenia, some patients respond to lower dosage and others require higher dosage for optimal benefit. Daily dosage higher than 250 mg is not recommended.